We’re headed to the big apple this weekend to vend at Vogue Knitting Live; and we’re bringing some exciting new patterns with us. 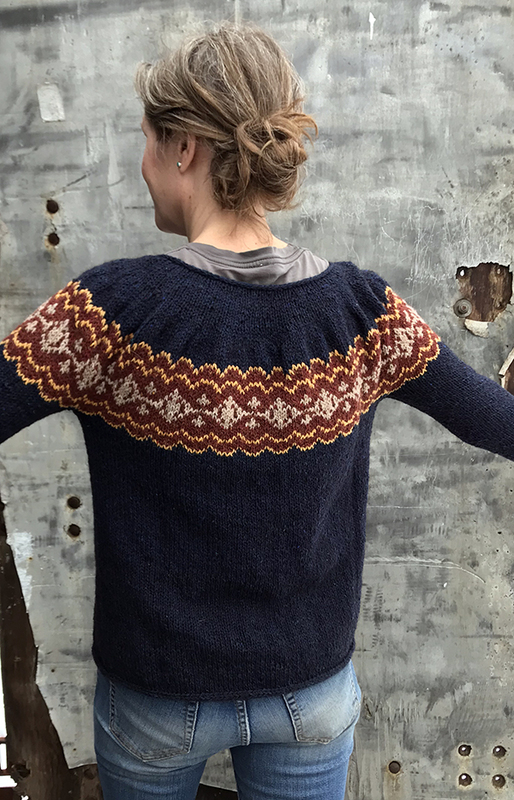 We’ve just published Maureen Clark’s new Stella pullover. This beautifully yoked sweater features a top down construction and classic stranded color work. You’ll work with just two colors in each row through the charted section and then return to single color stockinette for the rest of the project. You may find that it flies off your needles. The pattern includes a generous size range from 37 (40, 44, 48, 52, 56)” / 94 (102, 112, 122, 132, 142) cm. Yarn requirements range from 4 – 8 skeins of the MC and 1 each of three contrast colors. It is shown here in our Alpaca Elegance; MC: Ceylon CCs: Chai, Chamomile, Roobois. We’ve also released the four patterns that were part of last year’s Mystery Project Club to the public! 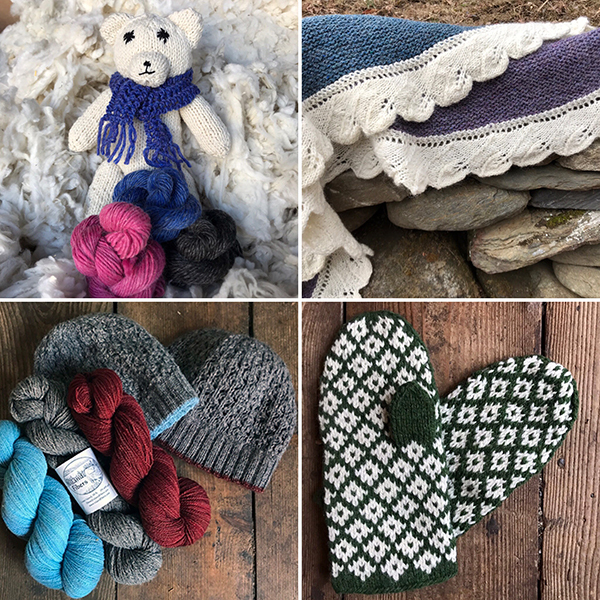 You can now find (clockwise from the top left) Cap Sease’s Polar Teddy, Larisa Demos’ Cirone shawlette, Maureen Clark’s Swedish Mittens and Kate Salomon’s Lopez Island Cap here on our website and through Raverly. Our 2018 Project Club featured four projects that paired some of our yarns with those that we spin for fiber producers you may know. Each design calls for two yarns, both created here at the Spinnery; a custom spun yarn and one of the yarns we’ve created for our shop. We’ll be featuring these patterns in the coming weeks on our Instagram feed as part of our Free Pattern Friday contest. And we’ll highlight each of these patterns in a future blog so that you can learn a bit more about the fiber producers we partnered with to create each of these designs. We hope to see you in Manhattan this weekend so that you can enjoy our samples in person. And tune in next week to learn more about Catskill Merino’s unique fiber (that was used to make the adorable teddy bear shown above).